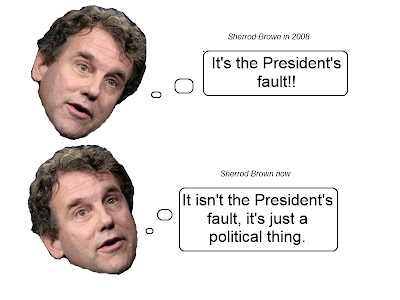 Over a year ago, when gas prices climbed back to $3.00 a gallon, I wrote this original post, highlighting what Sherrod Brown said about high gas prices in 2006 when he ran for Senate and then again in 2008. "The Bush Administration and Mike DeWine Are to Blame..."
"The high gas prices are the result of eight years of Bush energy policies, and high food prices are the result of Bush economics." At the time of that 2006 "report", the average cost of gas in Ohio was about $2.90/gallon. As we all know, gas prices came back down, even staying under $2.00 for a time. The second link is also dead, but our wacky friends over at Ohio Daily Blog still have Sherrod's original quote where he blamed the Bush administration for $3.00 gas. So, what does Sherrod have to say about $4.00 gas these days? Should we blame the president's energy policy like HE did 6 years ago? No. 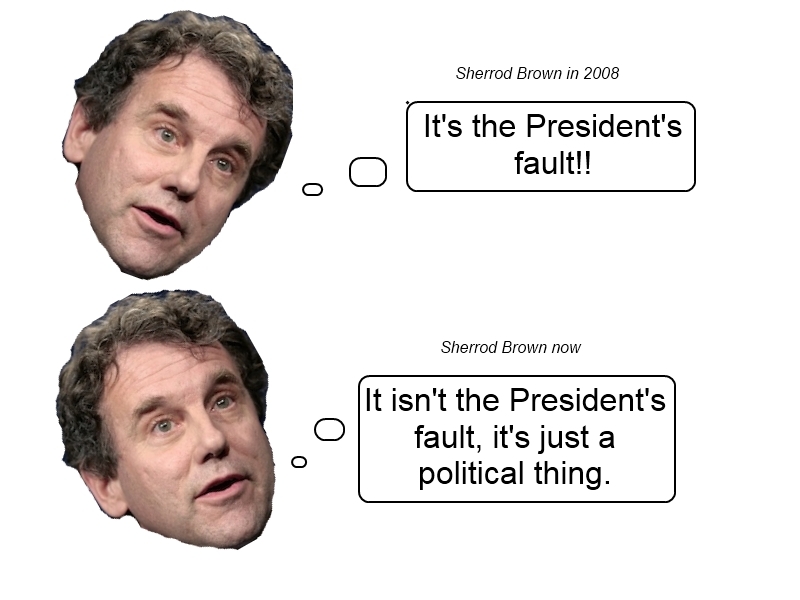 In fact, to Sherrod Brown, gas prices aren't really an important issue at all anymore. It's just a political thing. It cost me over $60 to fill up yesterday. But Sherrod says my concerns are "just a political thing." My, how your tune has changed, eh Senator Brown? Meanwhile, while Sherrod keeps promising us that he's going to fix things by punishing some phantom "speculators" who he never seems to be able to name, he stood with Barack Obama in blocking the Keystone Oil Pipeline. Even when it comes to gas prices, Sherrod Brown's answer is still class warfare. Pathetic, Sherrod. Ohio isn't California or Vermont. We've had enough of being represented by the country's most liberal Senator. Vote him out this November.